← Use it or Lose it! If your dogs are like mine, they don’t mind the cold weather one bit! If it were up to them, they might play outside all day! But the reality of the short days and cold weather sometimes make it difficult for us to meet our dog’s exercise requirements – Physical and mental! Dogs need just as much mental stimulation too! My dogs are driven enrichment seekers, always looking for something to do, to stimulate their mind. If I’m not giving them something to do, believe me, they are finding something to do! So, what can we do with our dogs when we can’t get outside? You can probably spend hundreds of dollars buying doggy puzzles. They’re great, but there are also a heap of fun things you can do at home to help fulfill your dog’s needs when you can’t exercise them outside. Training is always a great idea – But, if you’re like me, sometimes you grab your treat pouch and thing, hmmm.. What should we do? Here are some ideas on fun things you can do with your dog during these cold winter months. They’re quick, easy and when you see how your dog’s eyes light up when you start doing them, you’ll want to do more and more! Wait and Look – Asking your dog to wait for something is like teaching them how to say please. I ask my dogs to wait for virtually everything (of course, not every single time, but often throughout the day!). They need to “wait” and “look” at me – this is like their gateway to get what they want… Going out the door, eating their food, hoping on the couch, taking the treat from my hand, waiting at the top of the stairs for me to go down first… Takes two seconds , uses your dogs mind and teaches them a little impulse control! Mealtime – Many of us feed our dogs a raw diet. Besides all of the physical benefits, it also has mental benefits. Raw takes our dogs much longer to eat, crunching, spending time manipulating the food in different ways so they can chomp and grind. It’s a great mental stimulator. If you don’t feed your dog raw, try feeding their kibble in different ways. Scooping it up and putting it in their bowl – Boring! Switch it up a little! You can scoop it up and put it in your treat pouch. Spend the next 30 minutes walking around the house, doing what you would normally be doing – But every 2-3 minutes ask your dog to do something (sit, look, lay down, shake paw, roll over, etc.) and then give a small handful of kibble as a reward. This way your dog is working for his food and it’s not just sitting in a bowl! You can up the ante even more during feeding time. Take an old towel and lay it, open, on the counter. 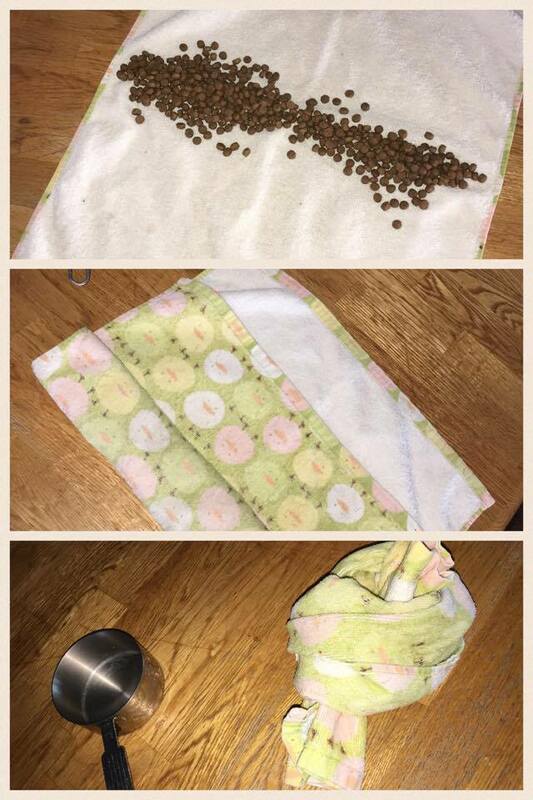 Scoop your kibble onto the towel (you can do this with raw too!). Then roll up the towel and give it to your dog. Your dog will have to use his nose or paws to unroll the towel to get at the food. Start very easy, maybe with the towel just folded in half. Each time you do it, make your roll tighter, so eventually you’re tying the towel in a knot! It will make your dog think and work for his food! 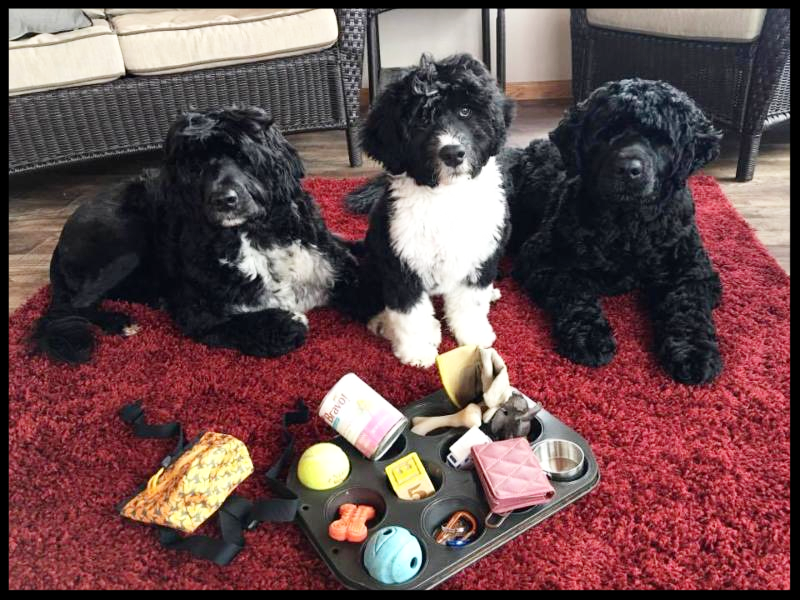 Homemade puzzles – You can make your own doggy puzzles at home with objects you already have! One of my favorites is to use an old muffin tin. Put a treat in each cup. Then cover each cup with something – Tennis balls, large rocks (make sure they are large enough so your dog doesn’t choke on them! ), etc. Once filled, set it down (remember to ask for a wait and a look first!) and let your dog have fun moving the objects aside to get the treats! There are a ton of great, fun things that you can do with your dog on these cold days – Shaping exercises, homemade obstacle courses, finding the treat in the house, and the list goes on! Get creative, have some quality time with your dog every day! They are with us for such short amounts of time, enjoy every moment you have with them! Use the CODE: connectwithmydog10 and get $10 off this class! Want a change of scenery? 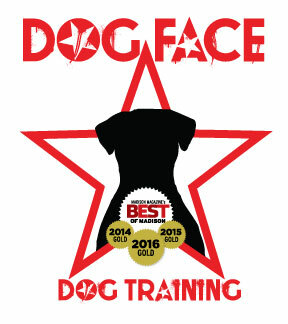 Dog Face Classes are a great get-away to have fun with your dog!